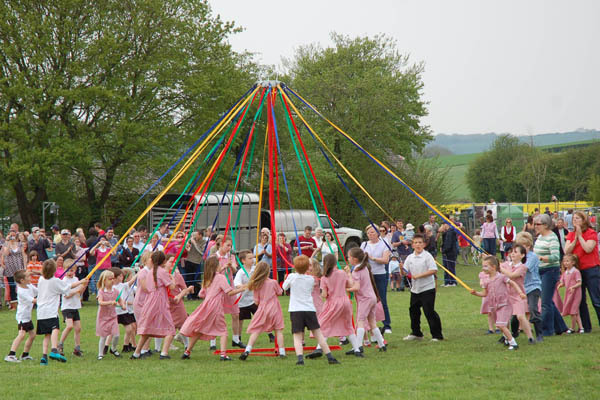 East Meon CoE Primary School, maypole dance. Fairs have been held in East Meon for centuries; a large field at South Farm is named Fairfield, and was the regular site for these events. In recent decades they have been staged by the Village Hall to raise money for maintaining the building. Click here for an account on East Meon History website of the foundation of The Country Fair in its enlarged format. 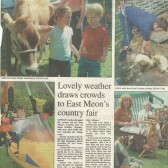 Below are three pages of photographs are from a variety of Country Fairs between 1993 and 2010. Click here for a further collection of photograph, assembled by Frank Wheeler. A number of programmes are available as PDFs, for the first Fair in 1993, later ones rom1998, 2002, 2003, 2004 and 2005. A letter printed in Meon Matters from the Chairman of the Village Hall Committee, John Simpson, is also available. Another page has selections of the paperwork from a number of fairs, dating from 2005 – 2011, which demonstrates the level of organisation demanded by the Fairs. Chairmen during this period included Anella Parker Martin, Pam Thorne and Sasha Brooks. In 2009 there was no Fair, due to shortage of volunteers. Whilst new housing was being built on Kews Meadows, in 2003 & 2004, the Country Fairs were held on the original site, at Fairfield, South Farm, loaned for the occasions by Michael Atkinson. Go back to Village Hall category for references to the Country Fairs, and the May Fairs/Fetes which preceded them, in the minutes of the Management Committee.